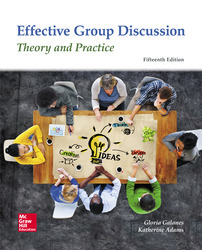 Now in its fifteenth successful edition, Effective Group Discussion combines the most recent research findings and practical tools students need to become productive group members. A variety of secondary groups are covered in the text: work groups, committees, task forces, self-directed work teams, and other small groups whose objectives include finding solutions to problems, producing goods, and creating policies. • SmartBook® - an adaptive digital version of the course textbook that personalizes your reading experience based on how well you are learning the content.